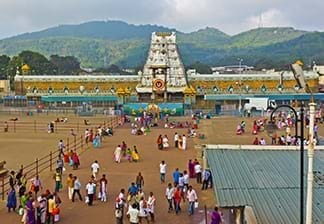 Located in Chitoor District of Andhra Pradesh, the city of Tirupati is an important seat of South India’s Hindu heritage which houses one of the holiest Hindu pilgrimage sites, the Sri Venkateswara Temple at Tirumala (Upper Tirupati). The history of Tirupati can be traced to the 5th century AD, when Tirumala was a thriving centre of Vaishnavism. Other than being a holy city, Tirupati is home to several scenic hotspots, trekking trails, and historical monuments. As the city receives a constant influx of devotees and tourists all year round, there are several hotels in Tirupati to cater to every breed of traveller. The city is well-connected by national and state highways, the Tirupati Main Railway Station, and the Sri Venkateswara Airport. Experiencing long, hot, and dry summers and relatively short, mild, and wet winters, the climate of Tirupati is decidedly tropical. This is why the best time to visit Tirupati is between the months of November and February. Thankfully, most Tirupati hotels have air-conditioned rooms for the ease and comfort of guests visiting during the hotter months. The city receives a fair amount of rainfall during the monsoon and the early winter months. Many Tirupati hotels are located close to major bus routes. If you are planning to visit Tirupati, hotel booking is best preceded by an understanding of your transport options for getting around the city. From the central railway station, visitors can avail themselves of free transport via APSRTC buses, which run every 30 minutes, to reach their hotels in Tirupati. As these buses stop at many popular destinations throughout the day, you can save money by hopping in and out at your leisure. Several hotels in Tirupati also provide private transportation provisions within their accommodation package. However, online service providers often omit this information and therefore, it is best to directly get in touch with your hotel in Tirupati for further details. There is a plethora of cab companies, operating within the city, which charge on the basis of time and distance travelled. Some Tirupati hotels also have partnerships with taxi services which can be booked for various day packages. Additionally, there are rental services in the area that provide vehicles you can drive around the city. However, the streets of Tirupati are typically narrow and may confuse an unfamiliar driver. If you do choose to drive, you must make your Tirupati hotel booking at a place that is conveniently located. When booking hotels in Tirupati, make sure to keep connectivity and accessibility in mind. The ancient temples of Tirupati are world-renowned sites of worship which attract scores of pilgrims and tourists throughout the year. The Sri Venkateswara Temple alone is annually visited by 30-40 million people. There are many other venerated temples in Tirupati including the Govindaraja Temple, Kapileswara Temple, Padmavati Temple, and Sri Kodandaramaswami Temple. These are situated at varying distances from the many hotels in Tirupati. 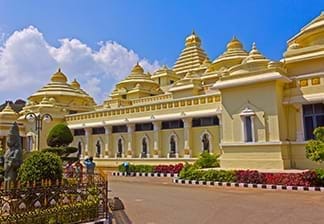 Before completing your Tirupati hotel booking, you may also want to consider your proximity to other local attractions. The Sri Venkateswara National Park, which is located amidst the Seshachalam Hills, for example, is located miles away from most Tirupati hotels. The Talakona Waterfall, which is located inside the park, is the highest waterfall in the state of Andhra Pradesh. The Chandragiri Fort, which is also some distance away from most hotels in Tirupati, is worth a visit for history buffs. If you plan to book your hotel in Tirupati online, make sure to create or request an itinerary. This will ensure that you cover destinations closer to the Tirupati city centre, such as the Sahaja Sila Thoranam Rock Garden and Space Exposition Hall. Visiting Tirupati’s temples and participating in the various rites and rituals that take place throughout the day can be a spiritually rewarding experience for pilgrims and tourists alike. The many festivals that are celebrated in Tirupati draw large and diverse crowds from every part of the country, presenting opportunities for dialogues on faith, studies on Vaishnavism, and photography. 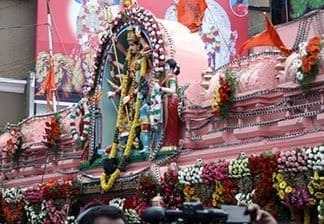 The Brahmotsava festival, which takes place over nine days in October, exhibits a vividly colourful, illuminating slice of Hindu culture for those unacquainted with the peculiarities of the religion. However, if you make your Tirupati hotel booking online during a festival, it is important to book well in advance. Most Tirupati hotels get occupied several days before a festival begins and room rates are usually hiked during these periods. 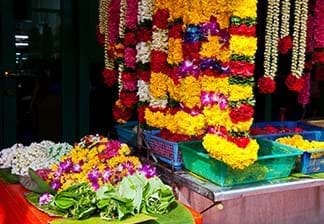 Most temples are surrounded by local markets which sell clothing, clay bangles, devotional trinkets, pictures of deities, knickknacks, and toys. Juice joints and snack vendors also set up their shops nearby, where you can grab a bite between shopping and visiting a temple. Please note that the consumption of alcohol, non-vegetarian food, and smoking is frowned upon near the temple premises and in certain hotels. While confirming your hotel booking in Tirupati, it is best to enquire about the specific prohibitions at the hotel. If your Tirupati hotel booking is made online, do go through the hotel’s terms and conditions. Travellers inclined towards natural beauty may also go bird-watching at the Sri Venkateswara National Park, which is home to many species of endangered birds and rare plants. 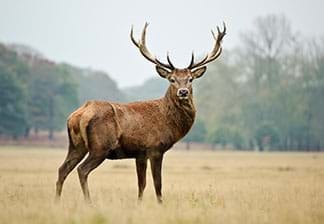 The Deer Park in the suburbs of Kandaleru provides ample opportunities for wildlife enthusiasts to observe, sketch, and take photographs of spotted deer. People who wish to combine the thrill of climbing with the act of worship can choose to walk from Tirupati to Tirumala on dedicated stone footpaths. More adventurous folks can flock to the ancient water courses at Tumbhuru Teertham, which abound in beautiful vista points away from the city. 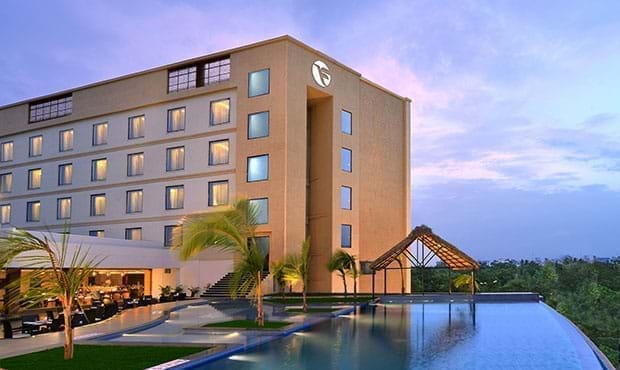 Fortune Select Grand Ridge, Tirupati, is a full-service hotel located in the heart of the city. Situated 1.5 km from the city centre, and at a nexus of connecting roads to the bus terminus, railway station, and airport, our hotel occupies a 17-acre prime property that marries convenience with comfort. Our central location allows our guests to save time while taking in the sights and sounds of Tirupati. At Fortune Select Grand Ridge, Tirupati, your cosy room is never too far away at the end of a long day. 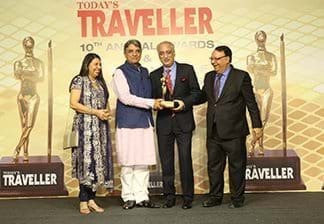 As an acclaimed name in the Indian hospitality sector, our emphasis has always been on forging a connection with our esteemed guests. In keeping with our service philosophy, we believe in addressing the specific needs and aspirations of each type of traveller visiting our establishment. Accordingly, while our hotel is furnished with an array of family-friendly amenities such as a vegetarian restaurant, gymnasium, spa, and swimming pool, the presence of a state-of-the-art business centre, high-speed Wi-Fi, and conference rooms make sure that our corporate travellers have all their business needs fulfilled. With a robust presence in forty-five cities across India, we have learned to infuse every aspect of our service with warmth, resolution, and integrity. We are certain that these principles in practice will create a bouquet of cherished memories during your stay in Tirupati. This Tirupati hotel offers 138 beautifully furnished rooms, consisting of 98 Standard Rooms, 35 Fortune Club Rooms, and 5 Suites. The rooms have been done up in a smart, contemporary décor with an inviting ambiance and come equipped with a complete range of modern amenities. At this beautiful hotel in Tirupati, some of the rooms also offer a spectacular view of the Tirumala Hills and the Shilparamam Park. Fortune Select Grand Ridge, a hotel in Tirupati, offers an amalgam of delectable cuisines that will tempt one’s taste buds. At this Tirupati Hotel, guests can savor their favorite dishes with either the 24-hour room service or can dine at any of the Fortune Hotels’ acclaimed signature restaurants: Rainbow – an exclusively vegetarian restaurant, Zodiac – the 24 hour Coffee shop and Neptune Bar & Lounge. 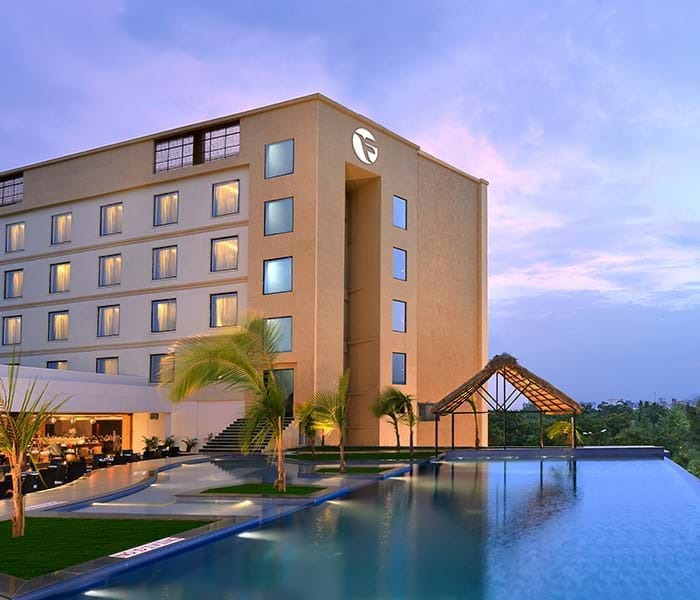 The Fortune Select Grand Ridge is a premier MICE hotel in Tirupati which offers a flexible choice of venue, both indoors and outdoors, for a range of events. From small board meetings for up to 20 guests to large social get-together for up to 2000 guests, this Tirupati hotel is fully geared to host every function in style.